"old-school perfect..the interplay is wonderful." "For fans of Chicago Blues, acquiring this CD should be a priority before sleep! " "All in all, Four Aces And A Harp garners deservedly high marks. With a gathering of blues talent like this, it would have been easy to wind up with a project that was overly busy with too many lengthy solos, but Harper’s production is old-school perfect." 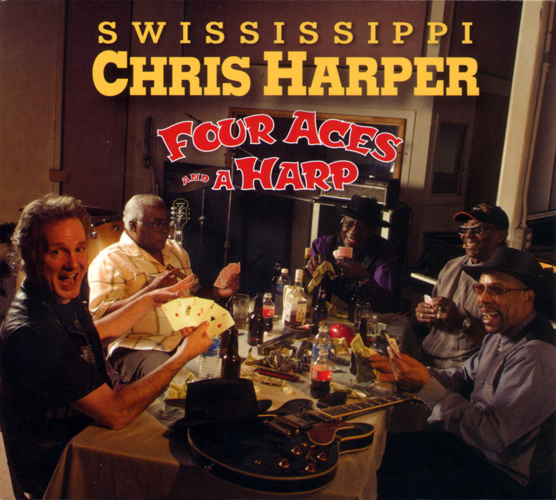 Switzerland is far away from the birthplace of the blues, but harmonica ace Swississippi Chris Harper's resonant, ringing solos and sound contain plenty of Delta edge and Chicago soul. That's because Harper, who's also Swississippi Records' CEO and executive producer, caught the blues fever at an early age and has spent his entire musical life making certain his playing never abandons the gritty, resounding qualities of those whose work attracted him when listening to records owned by his father. "There was something really magical in the way people like Sonny Boy Williamson (II) and Little Walter Jacobs and Big Walter Horton played the harmonica," Harper recalls. "They could bend and twist notes, play these incredible tones, do so many things on the harmonica, make it sound so big and yet also very much like the human voice, and as a boy it was fascinating. I sure couldn't play that way at first, and it took me a long, long time, but I was immediately drawn to the instrument by hearing what they could do. I was determined to one day really play the blues and add my own contribution to this great music." Harper spent a lot of his teen years playing bass rather than harmonica, and did his fair share of rock and jazz gigs along with blues dates. Then came a lengthy stint in the '80s and '90s doing something totally different from music. Harper formed and nurtured an events business into the biggest of its type in Switzerland and one of the world's most successful. Indeed, Harper credits those years with generating a desire to play because he really didn't have much time to either practice or perform. "But I think the hunger was always there anyway," Harper recalls. "I always knew that at some point I wanted to be a fulltime blues musician. I just wasn't sure when that might happen." Chris Harper came back to both the blues and the harmonica in early 2001. That's when he teamed with Chicago bassist Aron Burton a freewheeling live CD that established his comfort levels with playing demanding blues and accompanying a topflight musician. In addition, Harper's proficiency was sharpened through the assistance of another master harmonica player Sugar Blue. It was Blue who helped him master the tongue block approach to the instrument, a style that was the signature of Big Walter Horton, the person who taught Blue the method. "That was a revelation, working with Sugar Blue," Harper recalls. "I learned so much about dynamics, range, breathing, everything in connection with the harmonica and how to play real tricky licks and hit high and low notes. Sugar Blue's one of the great modern harmonica players and he was an excellent teacher." Since moving permanently to Chicago, Harper did the obligatory session and fill-in dates before entering into a venture with longtime musician/producer Dave Katzman. The duo wanted a venture that could both celebrate the heritage and accomplishments of the great surviving blues veterans, but would also release contemporary material that could attract newer fans and also reflect the technological advances in recording and production that are now part of the sonic landscape. Harper's certainly done that with his participation in "Four Aces And A Harp," a session that will take its place alongside other epic blues summit meetings like Muddy Waters' Fathers and Sons or Albert King's "Live At Montreaux" that included guest stints from Rory Gallagher and Louisiana Red. Harper's companions for the occasion are two supreme guitarists/vocalists in Jimmy Burns and John Primer, plus legendary drummer Willie "Big Eyes" Smith and bassist Robert Stroger. The musical menu also is nicely balanced between historic and modern, electric and acoustic, familiar and obscure, with an couple of originals included to provide listeners with a view of Harper's own blues portfolio. "The whole thing with this session was to pay homage to the greats, yet also make it very much have a current, fresh sound," Harper adds. "All the guys that we had know all the styles, and they're comfortable with them. I guess maybe the toughest thing was decided what to play because they can all play anything and make it great. We tried to find some songs that don't get played that much and mix in some that we felt were really a big part of the tradition. I was a little nervous about adding some of my own songs, but they were very supportive and really made me feel at ease. They also really did a great job on everything." The 18-tune release deftly covers the blues spectrum. Arthur Crudup's "Hand Me Down My Cane" and Lucille Bogan's "Sloppy Drunk," as well as Robert Brown's "Digging My Potatoes" and Muddy Waters' "Long Distance Call" are songs that you won't hear all that often either on blues radio or in performance. Bogan's chronicle of alcohol-induced mischief and Waters' classic boasting number are done with ease and grace. Though best known for his relentless rhythmic support, Willie "Big Eyes" Smith has also done his fair share of harmonica playing over the years, and his slithering runs make a nice contrast to Harper's animated smears and slurs on "Born In Arkansas." John Primer's in prime form doing Sam "Lightin' Hopkins' "Mojo Hand," depicting both Hopkins' laconic vocal edge and the tune's lyrical irony. "I Smell Trouble" has along been a shouting triumph for Bobby "Blue" Bland, and Jimmy Burns' doesn't try to echo Bland's signature snort or match his volume, but he does bring an equal amount of flamboyance and intensity to his version. Likewise, while Howlin' Wolf moaned and wailed with vigor on his rendition of Willie Dixon's "Evil Is Going On," this updated version has plenty of zip and energy, plus some growling heroics from the one and only "Tail Dragger." Harper's writing imprint comes through on "Blues Is My Life," a piece that nicely blends autobiographical insight with searing playing and heartfelt vocals, while "You Make My Fly" brings some sentimental touches into the mix and shows that Harper can smoothly make the transition from angst to warmth. He also displays his love for the shimmering, attacking Sonny Boy Williamson approach on two numbers that were a major part of his menu for years. "Eyesight to the Blind" is done in locomotive fashion, while Harper's playing is appropriately whimsical and edgy on "Fattening Frogs For Snakes (Took Me A Long Time). While he acquits himself very capably on all five of his spotlight vocals, Harper seems particularly at ease on Brown's "Digging My Potatoes" and Sleepy John Estes' "Worried Life Blues." On the former he's loose and a bit laid back, content to let the song's story build slowly to a solid conclusion. On "Worried Life Blues" he's more demonstrative, but equally confident, again comfortably developing and building the tune to a rousing conclusion. With Swississippi GM and producer Dave Katzman also part of the corps on six songs (including providing background vocals on Billy Flynn's "What's Wrong") and also ensuring a marvelous audio/sonic mix, "Four Aces and a Harp" has the vintage sensibility of classic blues LPs from the '50s and '60s, but the crystal-clear sound and precise blend of voices and instruments 21st century listeners demand. It's the ideal release to launch the label, and also a project that Harper's proud to have participated in and also be involved with. "This was a very special release in so many ways," Harper concludes. "I think it really does represent the best of the old and the new, and was also a chance for me to work with several of the greats and adjust my style to what they were doing and also adjust to the different types of blues we were playing. It was just a wonderful release, and a high point for me as a musician."